• Do not store above 25°C., • Store in the original package. 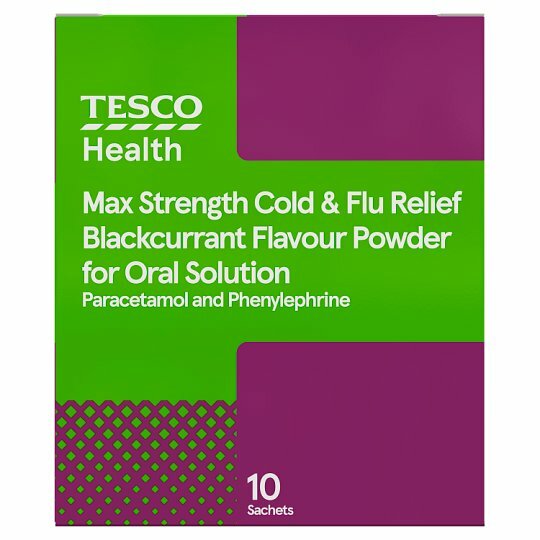 For oral use: Pour the contents of one sachet into a mug. Fill it with hot, not boiling, water and stir until dissolved and drink. • Adults, the elderly and children over 12 years: Take one sachet. The powder is taken as a Hot Blackcurrant drink. Wait 4 to 6 hours before taking another dose. Do not take more often than 4 sachets in 24 hours. • Not recommended for children under 12 years. Do not take more medicine than the label tells you to. If you do not get better, talk to your doctor. Please read the enclosed leaflet carefully before you take this product. CONTAINS PARACETAMOL . Do not take anything else containing paracetamol while taking this medicine. Talk to a doctor at once if you take too much of this medicine, even if you feel well., Contains aspartame which may be harmful to people with phenylketonuria., Consult your doctor or pharmacist before taking this product if you:, •have ever had liver or kidney disease, • are pregnant or breast-feeding., Keep all medicines out of the sight and reach of children.